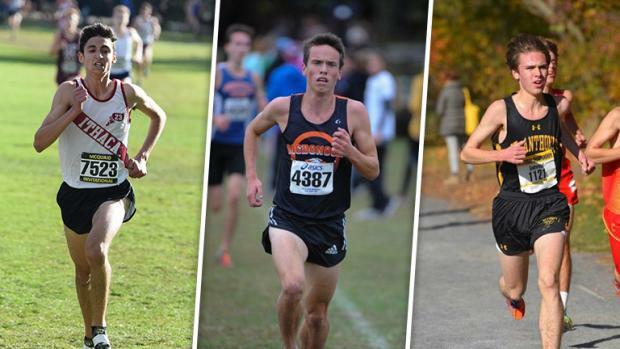 The 10th Boys Eastern States race at the Manhattan Invitational is set to go with runners from 31 different teams vying for a title that has occasionally been repeated about two months later at NXN nationals. Christian Brothers Academy of Lincroft NJ is again favored, but with five other schools packed in behind the five-time champ Colts at the 170+ speed rating level, the crown will not be resting easily for CBA. Three of the teams that will be lining up at Van Cortlandt Park to try to unseat CBA have special credentials. Green Hope, NC is coming off a strong 2nd to national leader Loudoun Valley, VA at Great American last Saturday and is top rated in North Carolina. Fayetteville-Manlius won both Eastern States and NXN nationals three years ago and again is among the top teams in New York. And Princeton, NJ finished just 11 points behind CBA at last year's Eastern States and is again looking strong behind frontrunner William Hare after a win at Shore Coaches. Corning, Ithaca and Niskayuna are among the top 10 teams in New York, Mount Tabor intends to do the job if its NC rival Green Hope can't, Kingsway would like to become the next Jersey giant, LaSalle (PA) wants to show its namesake from Rhode Island who really owns the name after two big wins this year, and Xavier's Knights will be defending NYC home turf. So this field is loaded. As always, although we already know who the winner is, we're not revealing the name until around 2:30 on Saturday. So pull up a chair on the VCP finishing stretch, get out your carrot cake, and get ready for some sizzling action. ♦ 4 US MileSplit top-25 ranked teams, and two teams from last year's NXN Nationals. ♦ 3 teams that are top ranked in their state (DE, NJ, NC,), plus 10 more that are ranked in their state's top 5. ♦ 4 of the nation's top 25 speed-rated guys. The weather could be rainy, so come prepared for some wet and wild times. Can't be beat.